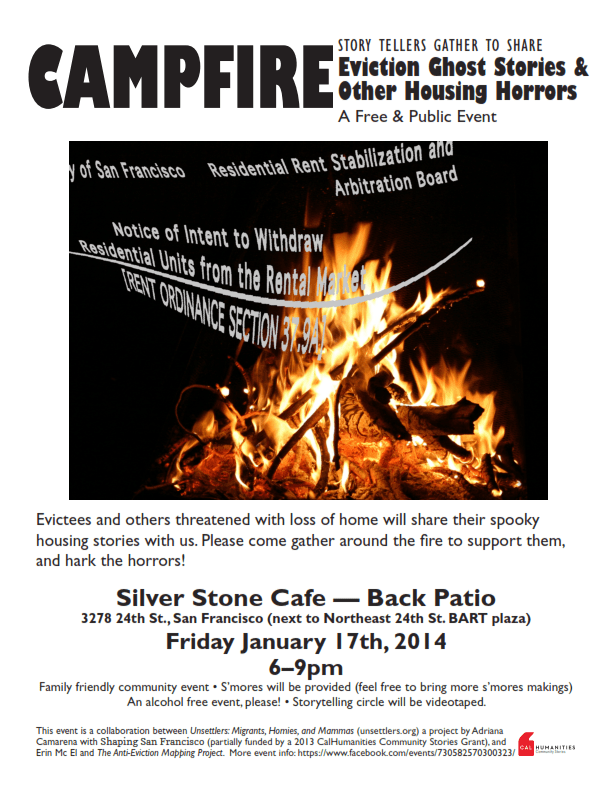 On January, 17, 2014, the “village” gathered around a campfire to hark the horrors of no-fault evictions of lifelong Mission residents and other San Franciscans provoked by rampant real estate speculation in the City. Fourteen brave storytellers shared their horrific experiences. Below is the resulting documentary film series Campfire: Eviction Community Stories, consisting of a documentary video, and 12 individual evictee mini-clips. Considered together, the evicted storytellers create a haunting picture of the vanishing characters, and therefore, character of San Francisco. Three residents of the Mission District of San Francisco: Polo Gonzalez, Sarah Brandt, and Rio Yañez share their on-going stories of eviction. They are lifelong San Franciscans, respectively, a cafe manager, a public school teacher, and an artist. In their narratives they also represent their elders: Ana Gutierrez (Polo’s senior mom), Mary Phillips (Sarah’s 98 year old neighbor), and Rene Yañez and Yolanda Lopez (Rio’s parents and legendary Mission artists). All of them are being Ellis Act evicted from their homes. This short documentary also includes an opening prayer by Catherine Herrera (Ohlone descendant and artist), and a closing prayer by Roberto Hernandez (Mission community organizer and protector of ancestry.) Song “La Mission” by ©2014 Ramon Garcia, Mission-born and -raised musician. The documentary series is the result of a community partnership between Shaping San Francisco, The Anti-Eviction Mapping Project, and Unsettlers: Migrants, Homies, and Mammas in the Mission District. Funded in part by a 2013 CalHumanities Community Stories Grant, Unsettlers was originally hosted as a special project of Shaping San Francisco. The documentary series was filmed at an event titled “Campfire: Eviction Ghost Stories and Other Housing Horrors”, co-hosted by Adriana Camarena with Unsettlers: Migrants, Homies, and Mammas in the Mission District and Erin McElroy with the Anti-Eviction Mapping Project at the Silverstone Cafe (24th Street near Mission Street), 6 -9 p.m.